2 drawings on paper, laminated (1 sheet) : ink ; top image 4.75 x 6 in., bottom image 4.625 x 6 in., on sheet 9.375 x 6 in. Ink sketches of men digging a ditch at compound 2, Lordsburg camp, 9 A.M. and prisoners of war from the Battle of Midway listening to Mr. Abe lecture on the history of the United States, November 7, 1942. Top sketch of view down a lane between rows of barracks with five figures digging with picks and shovels on left ; a figure walks across lane in background ; power lines line lane on right ; flag pole with flag, guard tower and mountain in background. 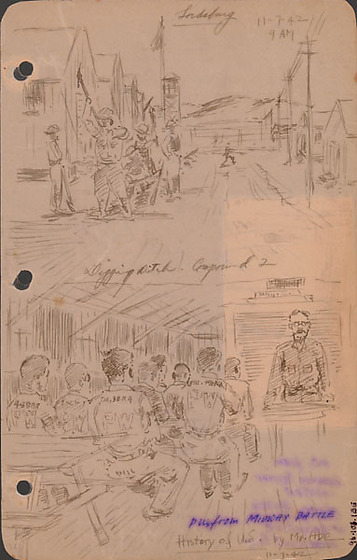 Lower sketch of eight prisoners of war sitting with backs to viewer on park benches in a barracks while a bearded man with glasses stands behind a desk on the right facing them and the viewer ; men have large letters, "PW", on back with numbers printed across shoulder blades. Drawing 97.106.1BF on verso of same sheet. Written in black ink, top: Lordsburg 11-7,42 / 9AM. Written in black ink on top image, bottom center: Digging ditch. Compound 2. Written in blue ink on bottom image, bottom right: PWs from MIDWAY BATTLE. Written in black ink on bottom image, bottom right: History of U.S. by Mr. Abe / 11-7-42. Written in pencil, bottom left corner: 26.